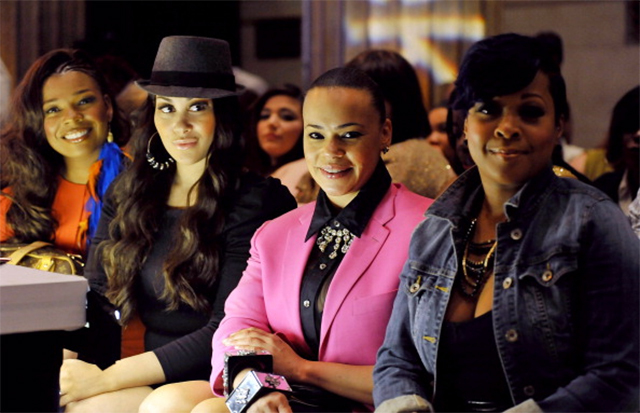 Full Figured Fashion Week 2012 kicked off last week at the Broad Street Ballroom in New York, and Guess What?, singers Faith Evans, Keke Wyatt, Syleena Johnson and Monifah were all in attendance, sitting front row. If you’re wondering what they’re up to these days, together they are preparing for a new reality television show “R&B Divas,” which will air on TVOne sometime this year. As far as the fashion event, Full Figured Fashion Week showcased some of the latest styles from several independent fashion designers, including Curvato, Savannah Red, Lavender Jungle, Jill Alexander Designs, Chinoo Designs, Rachel Pally White, Youtheary Khmer, and Jibri. It looks like they also had some pretty good entertainment.